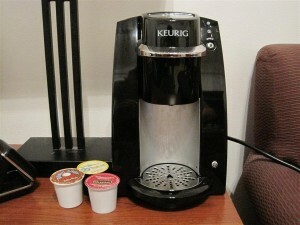 I am absolutely loving my Keurig single-cup coffee maker. I used to walk to the chow hall to get some coffee before work, now I quickly make a cup in my room. Why do I like this contraption so much? First, it’s the cleanest way to make coffee, given that there’s no pot to wash out or filter to deal with after the coffee’s made. You simply place a coffee pod in the brewer to make one cup, then throw it away when you’re done. Second, you can order variety packs, choosing a different type of coffee every day. They even have iced coffee and various teas available. Third, it’s convenient, brewing one cup of coffee in about 3 minutes. It brews fairly quietly which keeps from waking my neighbors. Finally, the brewer is small and takes up a small amount of space in my cramped dorm room. I highly recommend this coffee maker for the office, an extended TDY, or deployment. My favorite types of coffee are Caribou Coffee Daybreak blend and Green Mountain Coffee Nantucket blend.